If you have received a notice of eviction from a county court bailiff, the letter will set out the steps you will need to take at Court to stop any eviction from taking place. In short, an application must be made to the Court on the correct form with the correct fee paid (unless you qualify for fee remission because of low income, see here). The court would then list your application for a short hearing before the eviction is due to take place. However, whether the Court can actually do this will depend upon the grounds the Court made the Possession Order. There are two types of grounds available to the Court when making a Possession Order – mandatory grounds and discretionary grounds. You should be able to tell which the Court used in your case by checking the Possession Order itself. If you are unsure then you should seek advice without delay. If the Court made the Possession Order under a mandatory ground, it means that the judge had no discretion as to whether to make an Order for possession. It follows that if the court has no discretion as to whether or not to make an order, they have no discretion to stop an eviction. Such mandatory ground cases usually involve a high level of rent arrears known as ground 8, if you are an Introductory Tenant, had been living in temporary accommodation or if your landlord has brought the claim after issuing an s.21 notice. However, if you the eviction will cause you or a family member exceptional hardship, it may be possible to ask the court to delay the eviction for a short time. An example of where we have been successful in obtaining a delay was where a tenant was due to be evicted the day after she received chemotherapy treatment, the court agreed to delay the eviction as it would have caused her exceptional hardship. Although the Court has no discretion to stop an eviction in cases where the Possession Order was made upon mandatory grounds, there are some very exceptional cases where the Court may intervene if the eviction would be unlawful, irrational, unreasonable or disproportionate. This is known as a public law defence and it could be available if you have a landlord who is a public body. Such cases are quite rare and you should seek advice before making such an application to the Court, particularly as legal aid is available for this type of defence. We have been successful in arguing such a case where an Introductory Tenant had rent arrears due to a problem with Housing Benefit. Although the Court had no discretion at the time of the possession hearing and had no choice but to make the order, the Housing Benefit problem had been resolved after this time and the arrears cleared in full. We successfully argued that it would be unreasonable and disproportionate for the council to continue to evict the tenant in these circumstances. The court may also intervene where the eviction would amount to discrimination against a person who has a disability or another “protected characteristic” under the Equality Act 2010. A tenant must prove not only that they have the characteristic, but also that the eviction is because of discrimination. If the Court made a Possession Order under discretionary grounds, it means that they considered the ground for possession was made out (e.g. that you had rent arrears) and that it was reasonable to make the order. In such cases the court may have made the Order on an outright basis so that you are ordered to leave by a certain date, or upon a Suspended Possession Order basis so that you are able to remain in the property provided you stick to the terms of the Order. If an outright order was made against you upon discretionary grounds, the court then has a discretion to stop the eviction. To be successful in your argument though, you will need to show that something has significantly changed since the Order was made, for example, a lump sum was paid towards rent arrears. If a Suspended Possession Order was made and you have not adhered to the terms, then your landlord can now apply to evict you without further notice. You can apply to stop the eviction and you will generally need to show that you are back in compliance with the Suspended Possession Order or that there are compelling reasons why you did not comply and are now able to. Legal aid is available for such cases. The court has a very wide discretion when considering whether to stop an eviction taking place. They will consider how long you have been a tenant, what your circumstances are, whether you have children in the property, whether you are disabled and where you would go if evicted. If you have rent arrears you will also need to make an offer to repay the arrears, ensure that this offer will enable you to clear those arrears within a reasonable period of time and that this is affordable. 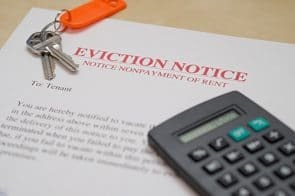 If the court agrees to stop the eviction based upon your agreement do something such as to pay the rent and the arrears each week, this is known as a stay or a suspension. This means that the eviction is “paused” so long as you keep to these terms. If you were to again fail to comply, then your landlord can simply reactivate the possession order and you will receive a new eviction date. In some cases, the court can dismiss the warrant completely. If the court refuses to allow your application and you believe that they have made an error in law when exercising their discretion then you have the right to appeal this decision within 21 days. If you are being pursued for rent arrears, you can issue a counterclaim at any time up until the eviction date, with the courts permission. A counterclaim is a claim you make against your landlord for their failure to perform a duty within the tenancy agreement and where you ask the court to reduce or offset the money claim against you. The most common type of counterclaim against a landlord is for their failure to carry out repairs when requested. Hodge Jones & Allen Solicitors have particular expertise in such cases. If you need advice as to whether or not you can apply to stop your eviction, please get in touch with our specialist housing team on 0800 437 0322 or request a call back online.